Aldo’s Adventure is a obscure little platform game released for MS-DOS back in 1987 by David and Ben Ibach. It is based upon a much earlier game called Ladder originally released for the Kaypro C/PM systems in the early 80’s. They have used the levels from Ladder with permission, so this is pretty much a port or graphical update for that game really. I found this game on a shareware collection disk that came with my copy of F19 Stealth fighter. The graphics are EGA, and are reasonably well drawn, but what’s most impressive is the animation. 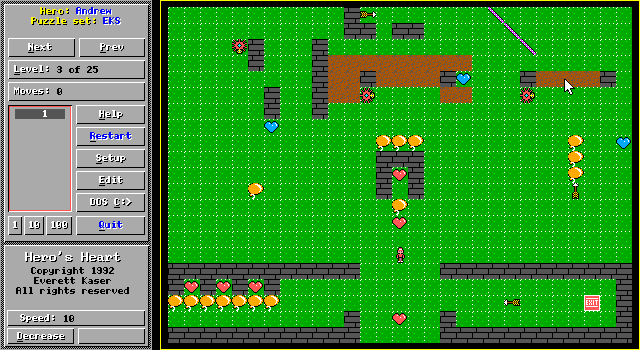 The animation is smooth and flicker free, the player sprite has lots of frames of animation and appears to move quite well. However the barrel animation isn’t anywhere near as nice and there isn’t anything else animated in the game. 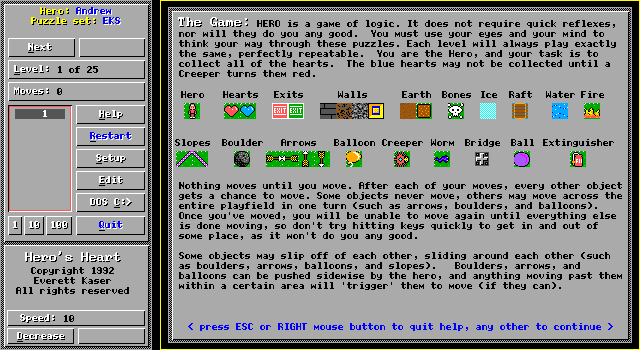 Like many other small shareware developers, a high resolution mode (640×350) has been used, which means some EGA features couldn’t be used such as page flipping. This means all the screen updates would have to happen during the vertical retrace to avoid flicker, some slower machines wouldn’t cope very well. There is no sound at all. Game-play wise it is pretty much a slowed-down version of ladder. The controls feel ok,but the pacing of the game feels a bit slow. With so few features, it sometimes feels like there isn’t that much to do, especially after the initial rush of barrels. To be honest because of the slowness the original on the Kaypro looks like more fun. You can find a little video of the Kaypro Ladder here on youtube, and a Java port here. 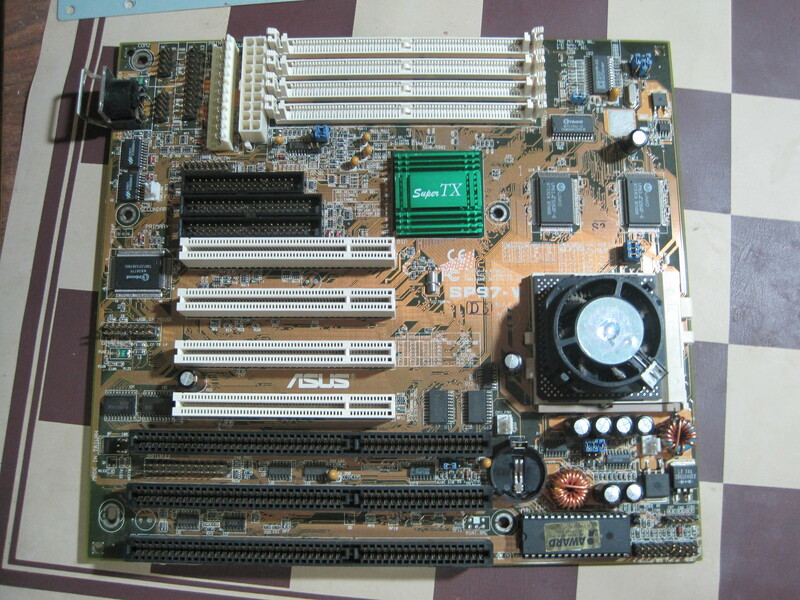 Today we’re looking at another socket 7, the ASUS SP97-V. This particular model was made around mid to late 1997 judging by date codes, putting it fairly later in the life of the socket 7 standard. Some notable features include dual power input and optional on-board video. 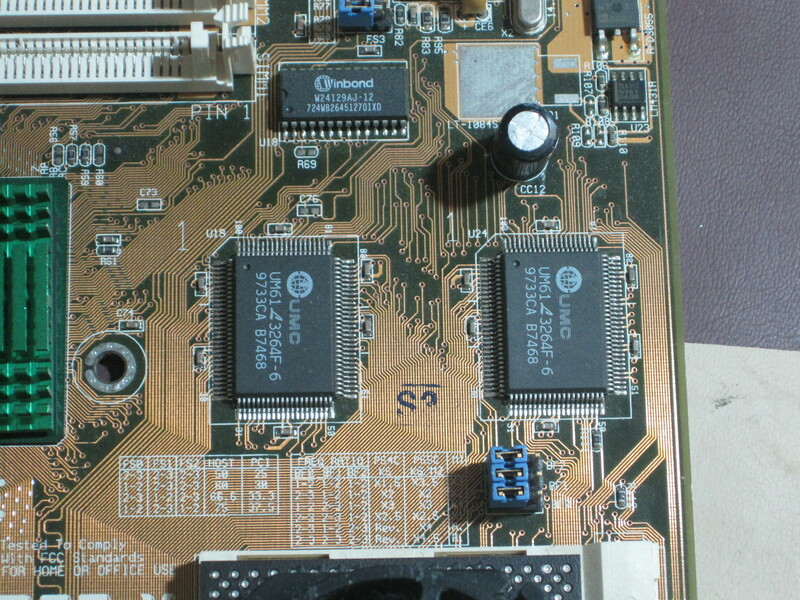 Here is the board is all its glory, note how integrated this chipset is. There are far fewer chips on this board compared to the older Gigabyte board I photographed last time. This one has a SIS 5598 chipset, which whilst reasonably good hardware wise didn’t enjoy good software support under windows 9x. Like the Dataexpert board, this one comes from a transitional time for computer technology. However it isn’t the RAM in this case, the power supply connections reflect the change. Note it has both the old style AT connectors as well as the newer ATX one. The ATX standard is superior in terms of electrical safety, and cannot be connected incorrectly. The board only supports 72 pin FPM or EDO RAM which was starting to be replaced by SDRAM at the time. I suspect the reason for omitting SDRAM sockets is to save money, as this would have been a budget board. The newer memory would have been more expensive per Megabyte, so excluding the sockets was probably not a big deal for cost minded consumers. 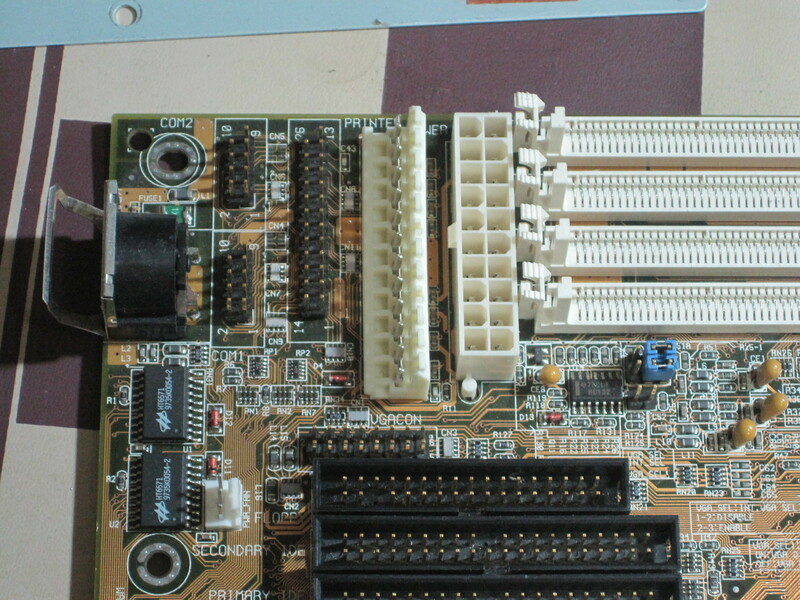 Like other boards this age it has L2 cache chips, in this case 512K pipeline burst cache. This is an important feature for faster processors that can consume data from the bus faster than memory of the time could deliver. For socket 7 boards in particular the bus speed would make a big difference to the maximum performance of the system as a whole. Later Super Socket 7 boards increased performance for pretty much any processor because of this. From the perspective of a technician this board is pretty good. There are not too many jumpers to configure, and those that are present have a silkscreen label to aid setting them. The jumpers are mostly for setting parameters for the processor such as the multiplier, voltage, and bus speed. The manual wasn’t too hard to find on the web if you have any trouble, but you’re unlikely to really need it. I’ve not seen this board in service so I won’t comment on reliability. I’ve not tested this board recently but some of the VRM capacitors are bulging. The fastest CPU it can support is the AMD K6-2 rated at 333Mhz equivalent. I doubt that part would achieve full performance on the particular board as the bus speed maximum is 75Mhz. I think a part of around 233Mhz would probably suite it better. This particular offering from ASUS was obviously a commodity board with sockets for the older but cheaper main memory, the lower chip count and small form factor. The on-board video is a nice feature if you were trying to save cash, but would have been a problem for anyone looking for better performance. Although the RedHill guide says the graphic performance was reasonable compared to low-end cards. The other integrated features were pretty much standard for the time, but impressively are mostly integrated into the main chip. Only a few ports like serial and parallel have external chips driving them. Hero’s Heart is a puzzle game with elements similar to Boulder Dash and perhaps a little of Chips Challenge. It was made by Everett Kaser back in 1992, he is a one-man game company that made many DOS shareware games back in the day and is in fact still making new games. You can can check out his newer work on his website: http://www.kaser.com. 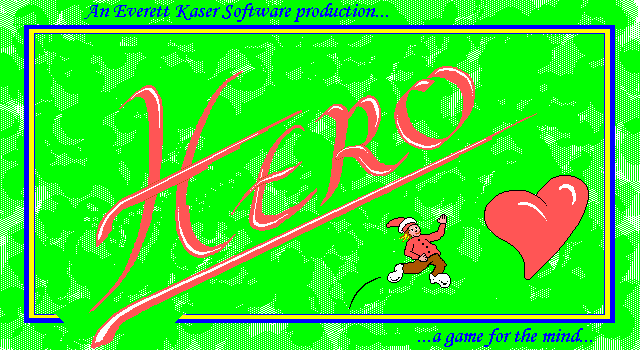 Like most of his old games, Hero’s Heart uses EGA graphics in high resolution mode (640×350). This was common practise for one-man shareware developers even after most other game developers had moved onto using VGA. I suspect this is because old machines with EGA only cards were common and for puzzle games such as these the higher resolution afforded more game space without having to do the difficult coding for scrolling. 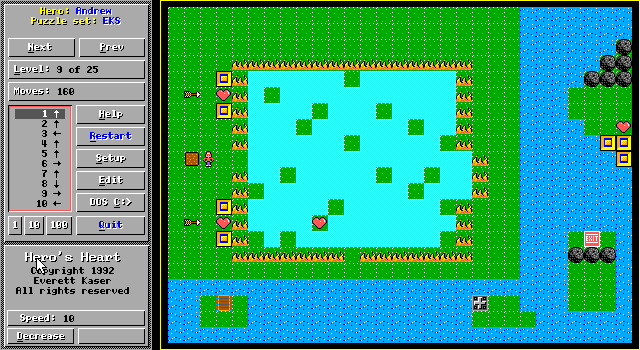 Despite the limitations of only 16 colours in a EGA mode, the sprites and levels are quite pleasing to the eye. There is only a little animation, but what is there works quite well. Come to think of it, this is something about most old DOS games that I do find rather nice. Looking over my collection of screen shots here in my media library I can’t help but note how colourful pretty much all old DOS games are. There are a few exceptions of course, but largely most are exceptionally colourful and nice to look at, even those with worse graphics. 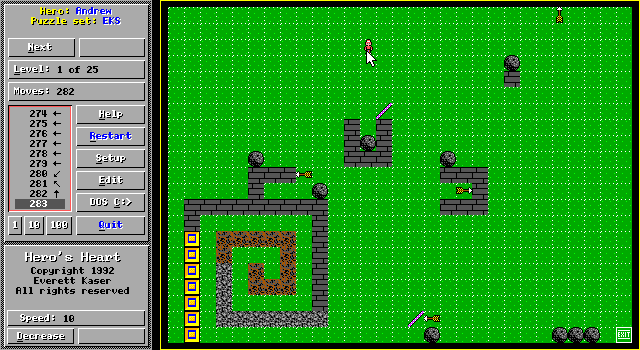 EGA graphics in particular, perhaps because of its limitations, seems to produce some of the more colourful scenes. Maybe it’s nostalgia in me talking. Hero’s Heart features PC speaker sound, but it isn’t turned on by default. If you click the setup button there are options for turning the sound effects on and setting music for the theme and end of level. I’d suggest you should only turn on the basic sound effects as they are ok, but the musical options are fairly basic renditions of classical tunes that don’t translate well to PC speaker. The game-play is nice and relaxed as it is turn based. Every time you move, all other objects also get a chance to move. If you happen to trigger something like a falling boulder or arrow, quick reflexes won’t get you out of the way. The puzzle element is sort of like Boulder Dash and Chips Challenge, there are objects to collect (in this case hearts) and hazards to avoid. Boulders fall like those in Boulder Dash, but only when triggered by a nearby moving object. Balloons behave similarly only going up instead of down. Arrows point in any direction but otherwise behave the same. Some parts of the puzzle are less hazardous, but still require thought. When moving onto or pushing something onto ice it can only move in a straight line until it hits something. Fire can’t be crossed without using an extinguisher to put it out first. Lumps of earth can also be pushed to put out fires, but are also useful to create land bridges over water, for longer stretches of water a raft is useful for crossing. Some of these are similar to elements found in Chips Challenge. Whilst the puzzles incorporate features similar to Boulder Dash and Chips Challenge, there are a few unique features such as bridges that roll out and hearts that require a specific enemy to walk into before you can pick them up. Also the construction of the puzzles is very different, the boulders aren’t the primary obstacle and most areas are open to movement for the player and hazards alike. 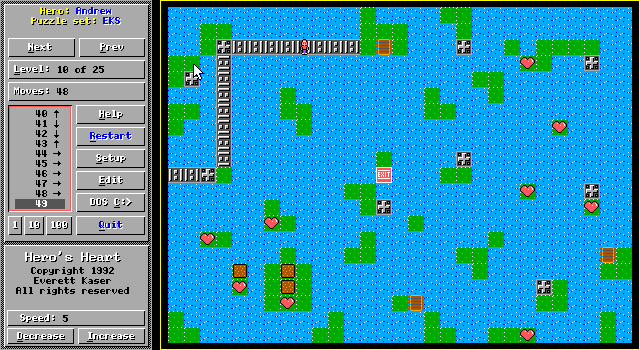 The puzzles are all one screen in size, and so don’t feel like mazes which you could get lost in. So this really does feel different despite the similarities. So far the game has been challenging, but not frustrating, primarily because you can attempt any level as often as you like with no penalty. If you really get stuck you can always skip a level as you can select any puzzle in the set to solve. I’ve gotten about half way through the shareware levels and have frankly gotten stuck, but have at least enjoyed the journey to getting there. If you really enjoy puzzles you should give this one a go.